In 2003 a Univ finalist researching an extended essay on the prose of T.S. Eliot came across the rich seam of Eliot material in the Alport Collection. Whilst looking through the first editions, many of them with inscriptions to Alport from Eliot, Rachel Oakeshott discovered a copy of Poetry magazine from June 1915 in which appeared Eliot’s first published poem, ‘The Love Song of J. Alfred Prufrock’. Looking through the fragile pages of this ephemeral publication, she noticed that Eliot’s poem had been corrected in black ink. The annotations included the excited exclamation, ‘damn!’ next to the misprint ‘spot’ where the poem should have read ‘soot’. Rachel’s research led her to meet with the poet’s widow who confirmed that the corrections were T. S. Eliot’s own. 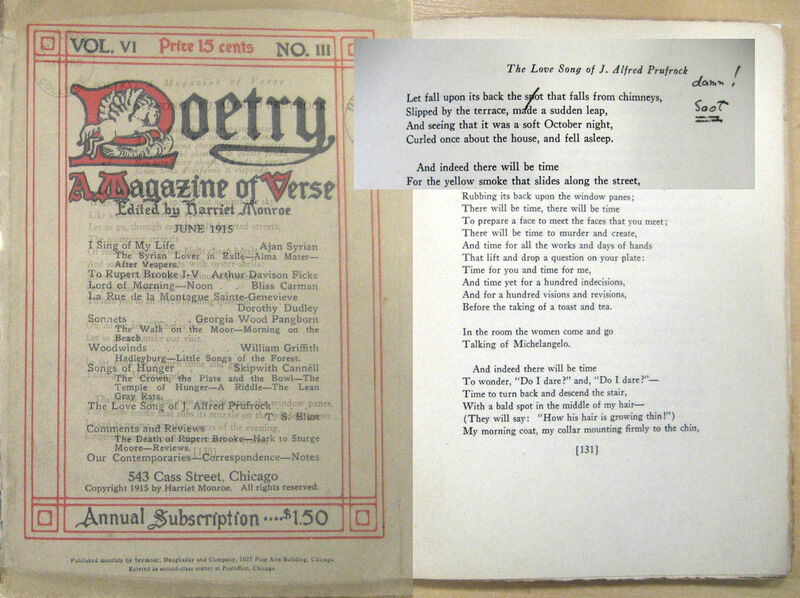 Cover and the beginning of ‘The Love Song of J. Alfred Prufrock’ with Eliot’s corrections in Alport’s copy of Poetry, vol. VI, no.III. Seymour, Daughday and Co. : Chicago. June 1915. Click image to have a closer look. ‘The Love Song of J. Alfred Prufrock’ was dedicated to a medical student, Jean Verdenal, with whom Eliot lodged during his postgraduate year at the Sorbonne in Paris, and who died age 26, a casualty of WWI. It was the title poem in Eliot’s first collection of poetry, Prufrock and Other Observations (The Egoist : London. 1917). Only 500 copies of this book were printed, one of which Alport acquired. 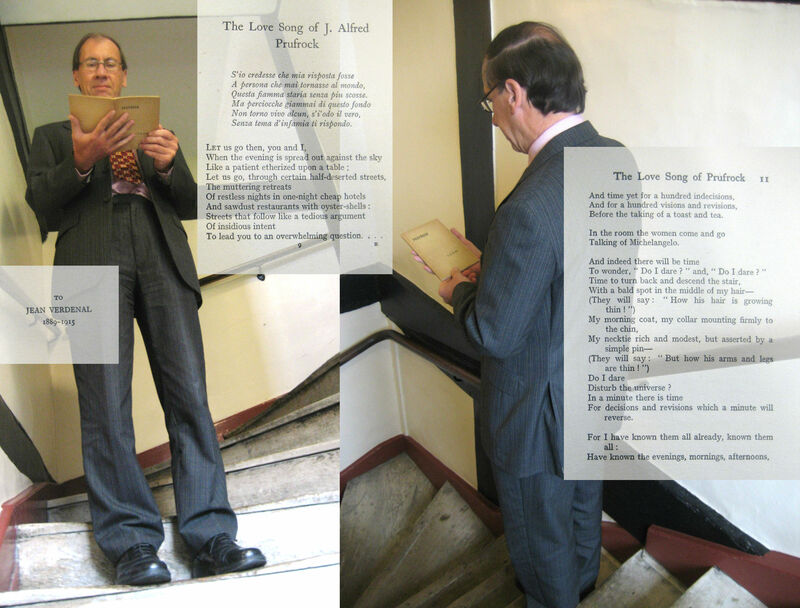 Peter one of Univ’s accountants examines Alport’s copy of Prufrock and Other Observations outside the Treasury; dedication and lines from ‘The Love Song of J. Alfred Prufrock’ in Prufrock and Other Observations. The Egoist : London. 1917. The number of inscriptions from Eliot in Alport’s collection implies that the two men knew each other, but where they met, in Oxford, Germany or London, and how they became acquainted, through friends, perhaps, or literary interests, remains unknown. Some of the most attractive objects in the Alport Collection are the five poems that Eliot contributed to Faber & Faber’s Ariel Poems series. The thirty-eight pamphlets in the first Ariel Poems series combined the work of authors and illustrators with striking effect. 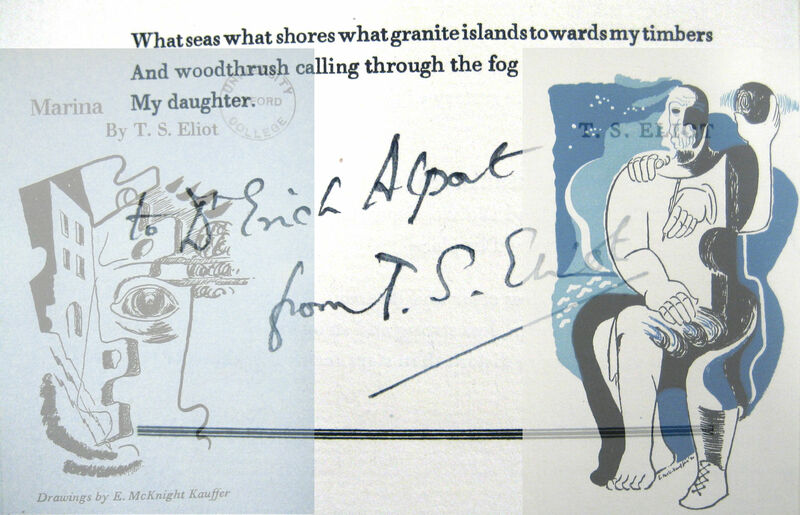 Illustrations by E. McKnight Kauffer and inscription from Eliot to Alport in Alport’s copy of Marina, no. 29 of The Ariel Poems, by T. S. Eliot. Faber & Faber : London. Each pamphlet has more or less the same simple, fragile structure; one sheet of paper folded and sewn inside a coloured paper cover. A black and white artist print on the cover and a coloured print inside are followed by a poem. T. S. Eliot’s poems are illustrated by Gertrude Hermes (Animula, no.23) and E. McKnight Kauffer (Journey of the Magi, no. 8; A Song for Simeon, no.16; Marina, no. 29; Triumphal March, no. 35). 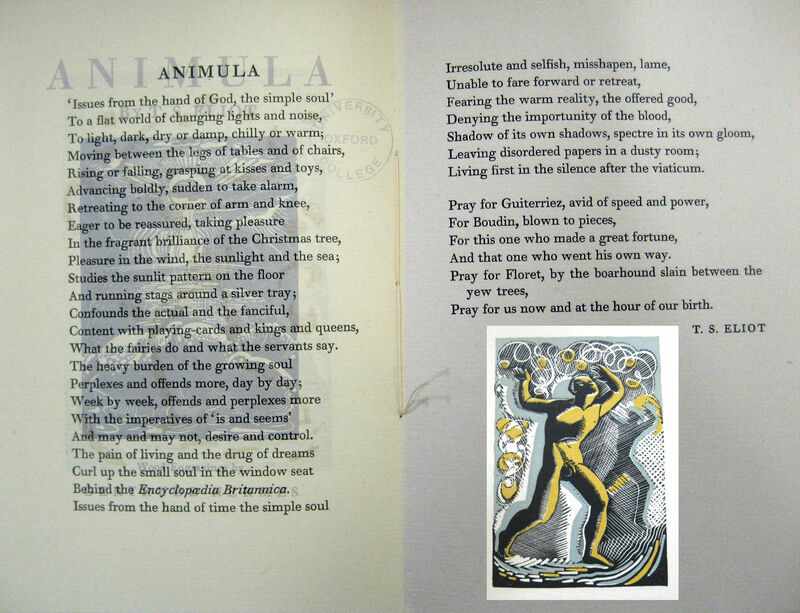 Illustrations by Gertrude Hermes and text from Alport’s copy of Animula, no. 23 of The Ariel Poems, by T. S. Eliot. Faber & Faber : London. Eliot worked for Faber as their Literary Editor as well as a writer. He left his job in a bank in 1925 to join the publisher where he was successful in signing and promoting new writers from W. H. Auden to Ted Hughes. His entry in the Oxford Dictionary of National Biography goes as far as to see his work at Faber as ‘defining the next forty years of British poetry’. 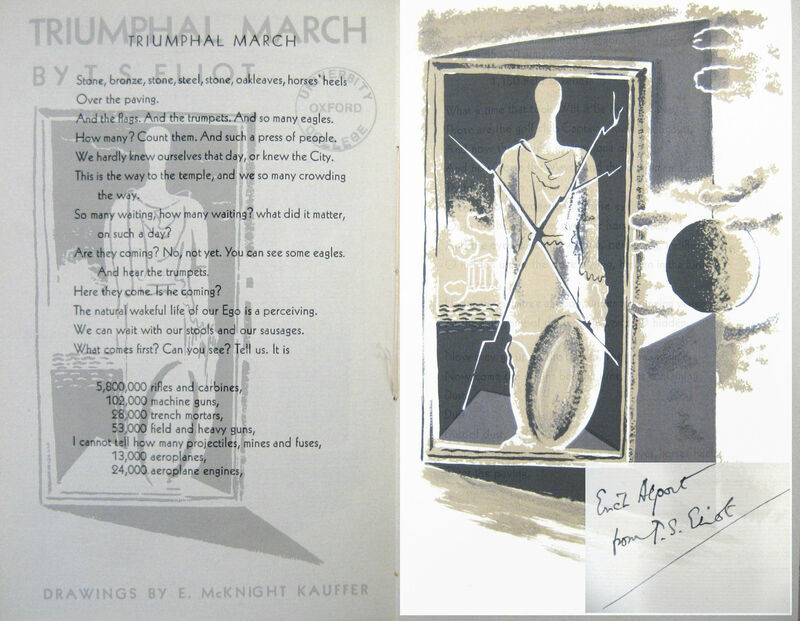 Illustrations by E. McKnight Kauffer and inscription from Eliot to Alport in Alport’s copy of Triumphal March, no. 35 of The Ariel Poems, by T. S. Eliot. Faber & Faber : London. After his baptism into the Church of England in June 1927, which took place at Finstock, not far west of Oxford, Eliot placed religion at the centre of his life. In 1931, Eliot gave Alport a pamphlet in which he reflects on the outcomes of a Report of the Church of England’s Lambeth Conference. Some of the issues Eliot was discussing in the 1930s seem very current today. Substitute Richard Dawkins for Aldous Huxley and passages about the perceived differences between older and younger generations and the relationship between science and religion could almost have been written yesterday. 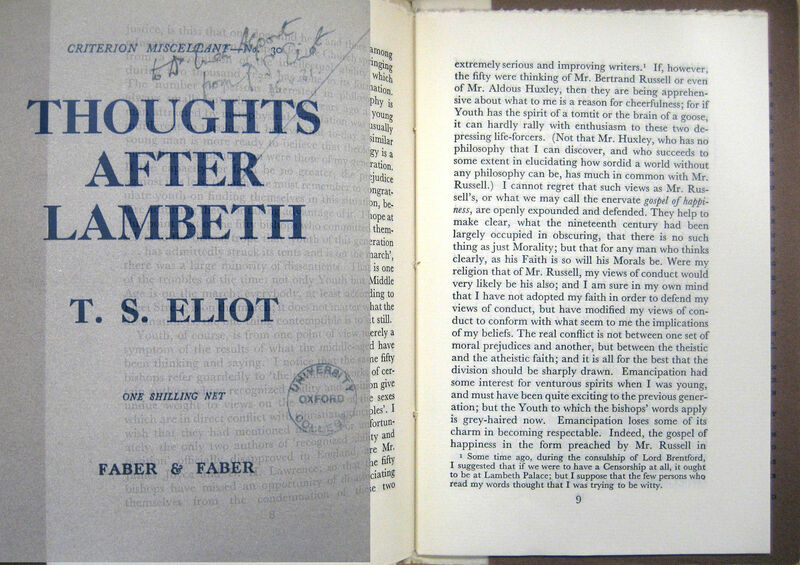 Front cover with inscription, and text (p.8-9) from Alport’s copy of Eliot’s Thoughts After Lambeth. Faber and Faber : London. 1931. Religion, in a broad sense, permeates Eliot’s later poetry. In the Alport Collection are early printings of three of the poems that make up Four Quartets. Alport kept the second poem in the series, East Coker both as it appeared in the 1940 Easter number of The New English Weekly and as it was published (as a stapled pamphlet) by Faber and Faber in the same year. 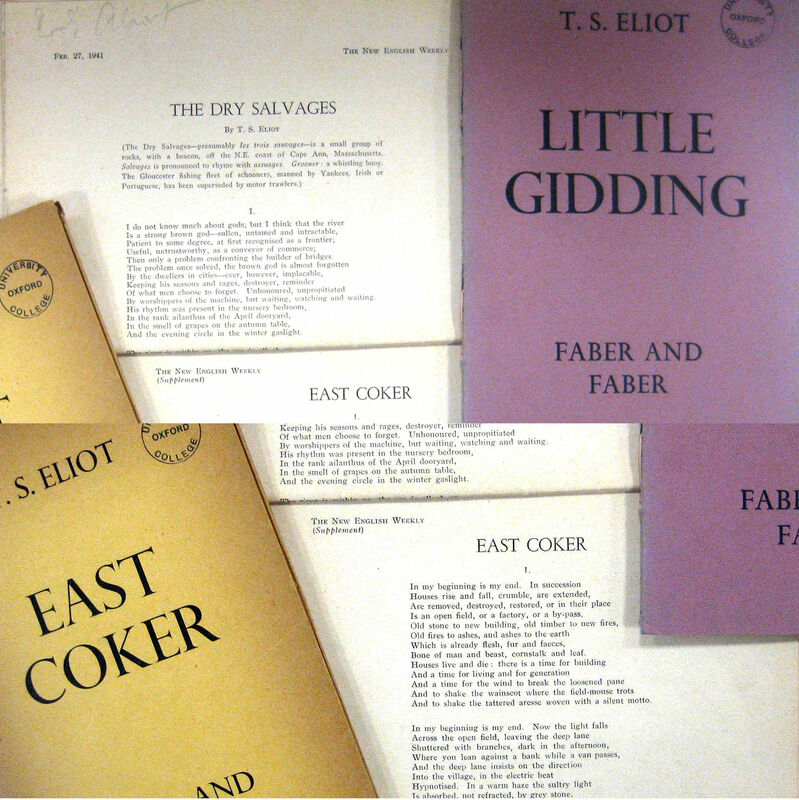 Three of Eliot’s Four Quartets from the Alport Collection: ‘East Coker’ in The New English Weekly, vol. XVI, no. 22. Easter number 1940 ; East Coker. Faber and Faber : London. 1940 ; ‘The Dry Salvages’ in The New English Weekly, vol. XVIII, no. 19. 27 Feb 1941 ; Little Gidding. Faber and Faber : London. 1942. You can hear T. S. Eliot reading his poems (including passages from Four Quartets) on The Poetry Archives website. If you’d like to find out more about T. S. Eliot or read some of his poems look on the first floor of the Library at class mark YIK/ELI. Bush, Ronald. “Eliot, Thomas Stearns (1888–1965).” in Oxford Dictionary of National Biography. Online ed. Ed. Lawrence Goldman. OUP : Oxford. Accessed 23 Oct. 2012 <http://www.oxforddnb.com/view/article/32993&gt;. University College. ‘Leading the Field’ in Univ Newsletter. Issue 16. Michaelmas 2003.